New Balance 860 v8 are stability cushioned running shoes. 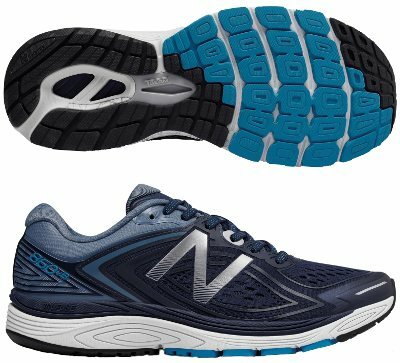 The always reliable New Balance 860 v8 updates one of the best "value for money" saga from the american brand although most marketing budget is invested in its bigger (not only because of numbering but also for price) sibling 1260 v7. One of the reasons of the successful 860 v8 is featuring a well-known frame which performs as expected, moderately away from major changes and disrupting technologies, something that can be found in other running shoes like Fresh Foam Vongo v2. Probably the most common complain regarding its predecessor 860 v7 has been a more rugged cushioning than desirable, something which is under the radar for current edition. Although midsole configuration remains the same with full-length ACTEVA® LITE layer on top of durable ABZORB® foam (codename TRUFUSE from New Balance) plus classical medial post for pronation control, softness in some elements has been increased to provide a more comfortable running experience. Drop sticks to 10 mm for smooth transition while T-BEAM shank delivers torsional stability through the midfoot. Outsole in rear area moves away from big lugs pattern to engineered flex grooves to improve shock absorption, something that will appreciate specially heel strikers. Although upper is pretty similar to previous edition, it receives few updates for general improvement: toe cap reinforcement is better integrated and is now fused instead of stitched, a similar approach than in premium Fresh Foam 1080 v8. More ventilation holes have been added to enhance breathability and typical logo from New Balance is made of reflective material to increase visibility under poor light conditions.